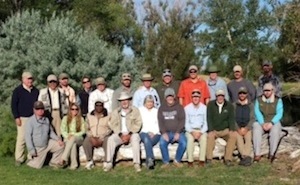 With the help of wonderful volunteers and fundraising efforts, for the past 12 years we have had the priviledge of hosting hundreds of wounded service men and women on fly fishing float trips down Montana’s Smith River. For the last 6 years, we teamed up with Project Healing Waters Fly Fishing, a non-profit dedicated to the physical and emotional rehabilitation of disabled military service personnel and disabled veterans through fly fishing and associated activities including education and outings. We have availabilty for sponsorships for the week of July 5-10 at Healing Waters Lodge. Please call Mike Geary (406-459-2030) for more information. Group photo July 2015 at Healing Waters Lodge.